I was invited to attended Kristal Astro repackaging presentation this morning. Want or don't want you also have to read this post before you cry father cry mother out there! I posted they channels, packages and prices list early this morning already got some people cry out loud complain the price increase. 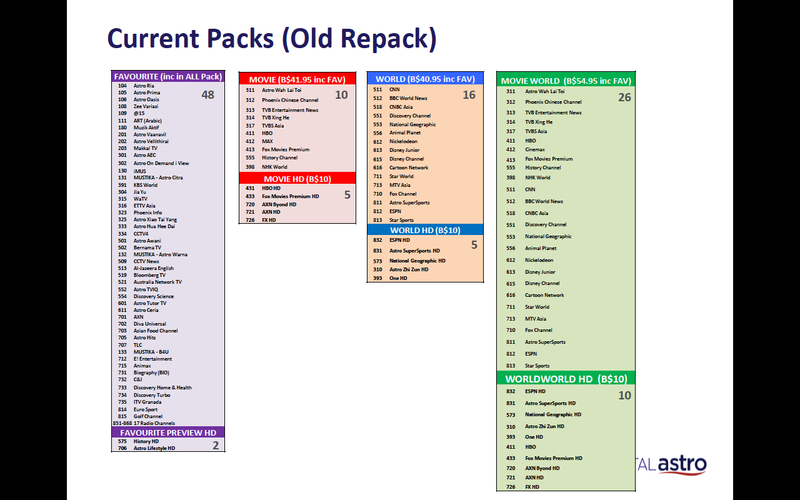 Of coz if you just look at the list no doubt the the price is increase. But if you see deep deep of it there is a lot of good stuffs there. Let me make it short and explain to you. 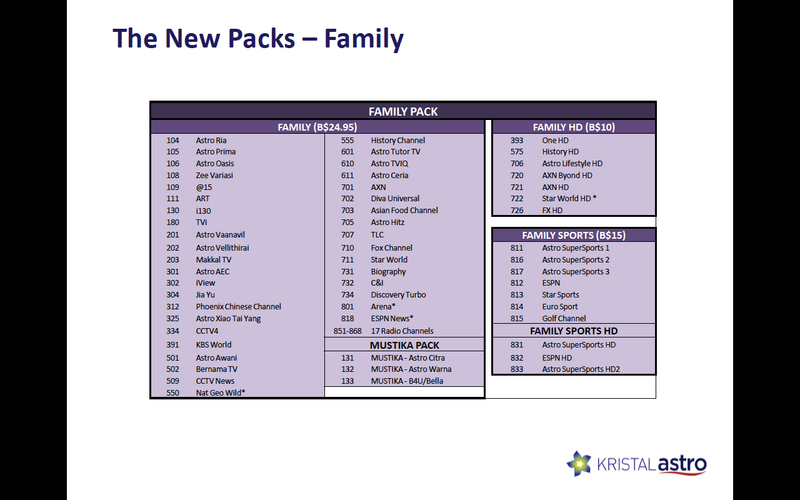 I believe my Astro channel most likely are same like you one have all the channels (except HD) and it cost me $54.95 per month. Is has Movie, sport, chinese, malay, india, food, travel, children, business, news etc...... correct??? 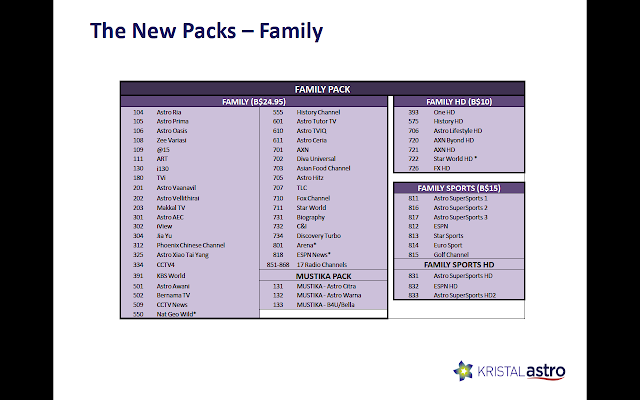 Ok but now the new one is going to cost us $55.95 with some new channel like "Nat Geo Wild", "Baby TV", "Arena", "ESPN News", "Mustika-Astro Citra, Astro Wanan and B4U/Bella"
Good right!!!! got few new channel!!! But............. NOT WITH THE SPORT CHANNELS!!! So if you want sport channels you have to subscribe it and cost you another $10.00 extra!!! All together is $65.95!!! Yes if see like that of coz it is expensive liao... Everyone also prefer the "Old Package"
BUT.......... 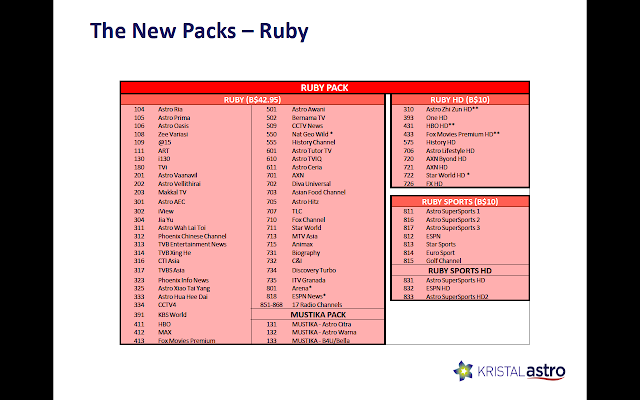 I love the NEW Package, Why??? Because of 50% discount for the second subsequent subscriptions. 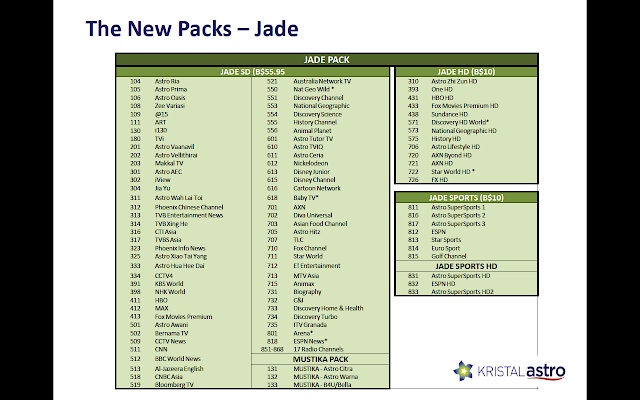 Which mean that I have share with my sister and now can be more cheaper that last time and get more channel. 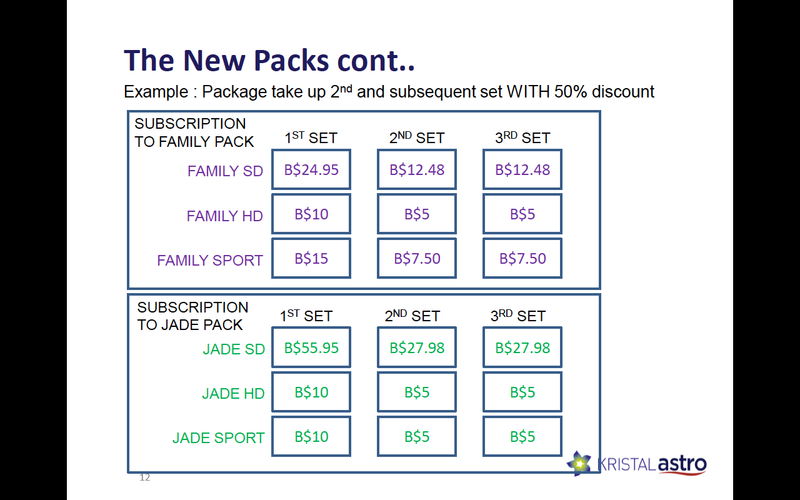 And if is for those HD subscribers lagi good... More channels and only cost you $10.00 same price like last time one!!! GOOD Right!!! 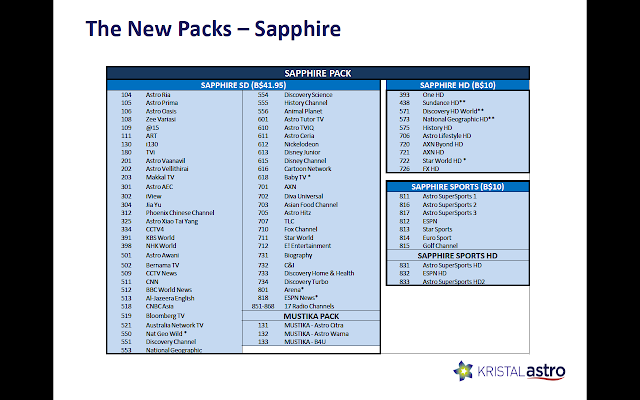 Alright.... this is what I can share with you all... if you have any further question like why no channel 305, I don't watch Indian channels why I still have to pay!! !, Take away the chinese channel got discount or not? bla bla bla bla bla.... Please don't ask me I'm not work with Kristal Astro ok!!! 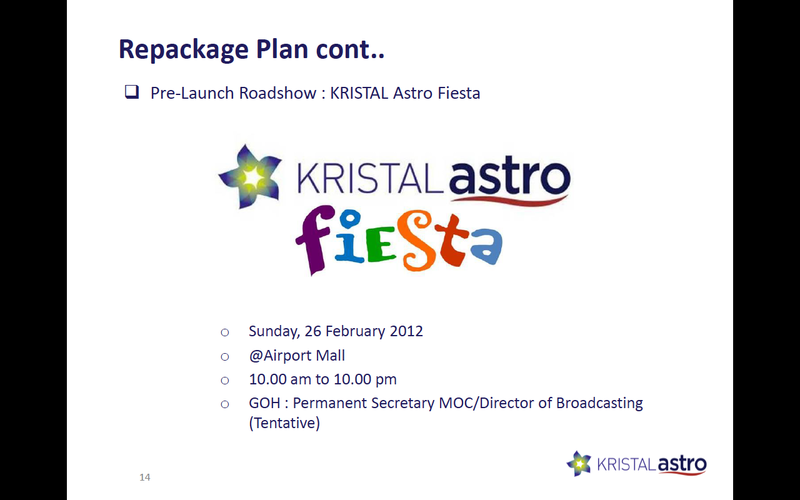 If you want you can go to their Kristal Astro Fiesta roadshow at Airport Mall on Sunday 26th Feb 2012, 10am-10pm!!!! Free viewing of all channels to all the active subscribers early in the morning (00:01hrs) 23rd Feb to Midnight (23:59hrs) 29th Feb 2012. Compare the Old one with the New package. Package 2 - Ruby Pack, for the movie kaki!! !